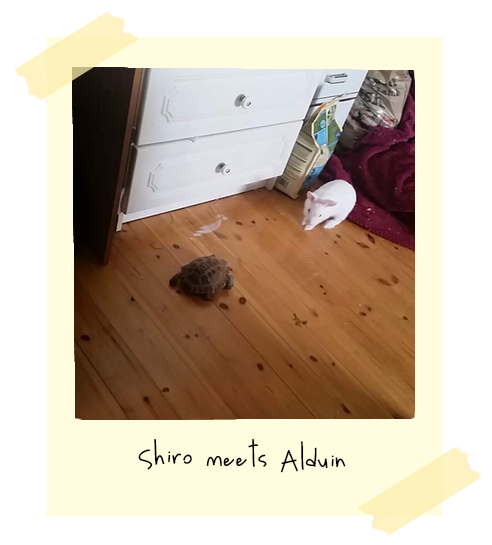 We had Shiro for about a week or two before we intorduced her to the other animals in the house, because we wanted to give her some time to settle in. She always wandered over to the tortoise tank, because she could hear them moving around in there. So one day I took the tortoises out and let them meet. Dovahkiin just stayed in his shell and went to sleep. Alduin when right up to her and she went over to him. They moved towards each other slowly, and a little after this photo was taken Alduin turned and walked away from her. 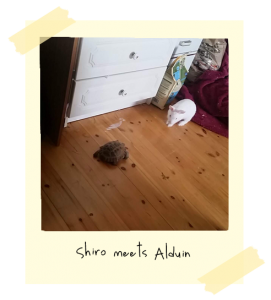 Shiro hopped after him trying to smell him. I don’t think she knows what he is. She likely thinks he’s a moving rock. And he thinks she’s a giant furry monster.